2010 elején a zenekar megjelentette a bemutatkozó anyagát, a Hell Sweet Hell című korongot, ami azonnal sikeresen teljesített a lemezpiacon Alaszkától Ausztráliáig. Két év turnézás után jött ki a második lemez, a Circus Of Shame. Ezalatt a hat év alatt, majdnem minden európai országban jártak, és USA-ban is koncerteztek. Több éves szünet után a zenekar új tagokkal ismét útjára indult, és 2016-ban kiadta Astoria című lemezét is. 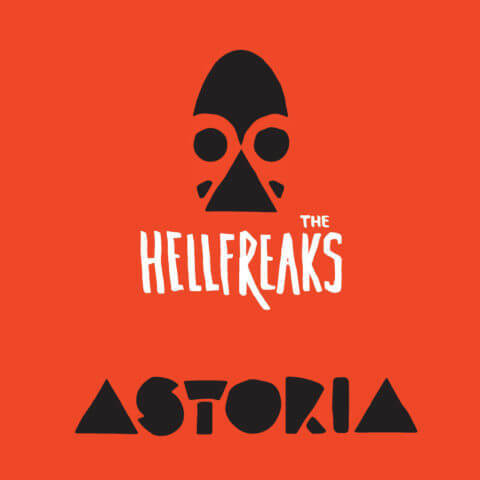 During the summer of 2009 The Hellfreaks recorded their first demo. That very same year the Program For National Contemporary Music Culture in Hungary invited applications music and motion pictures. Despite over 180 submissions, The Hellfreaks won the competition which gave them the funding required to produce their first music video for their single „Boogieman” which instantly resulted in over 3,000,000 views on Youtube. At the beginning of 2010 the band released their debut album „Hell Sweet Hell” which went to almost immediate success being sold to fans from Alaska to Australia, from Budapest to Birmingham. After another 2 years of touring, the world was ready for their next album „Circus Of Shame” recorded on german label Longneck Records. A mix of punk rock and psychobilly a healthy touch of take-it-or-leave-it, alternative model and vocalist Shakey Sue and her 3 partners in crime set out to take their fans by storm and tell the critics ‘ Listen to this now!” The Hellfreaks continue to show fans across Europe and USA that as a hard touring band they can draw and play to audiences regardless of geography. They have performed in almost every European country, from small clubs to major festivals such as the WGT, Rock’n Ink & Force Attack in Germany, the Psychobilly Meeting in Spain, Club Sin in Finland, Warhead in Poland, Pod Parou in Czech Republic, The Whoolwich Grand Theater in London, Bedlam Breakout Festival in Northampton and countless other venues.